In turn order, players will place 1 of their bidding cards at one of these slots facedown. Initially, all players will start with identical sets of cards (numbered 1-5). Due to the ability to upgrade, players may start to have different cards later on in the game and this is where being able to understand what your opponents want and will play that will be crucial. Once all cards are played, areas where there are cards are revealed. Some areas, the player with the highest sum total of his cards there will win the item/action. For example, if you are at the ships market, you will win that ship as long as the sum total of your cards is higher than your opponents. There are a few spots though where the numbers on the cards played matters. For example, the construction spot. The player(s) with the highest total sum will get 1 build for free. Each other player there will have to pay the different between their sums for the 1st build. Subsequently, if they want to build more, they will need to pay the highest total sum for each construct action they want to implement. This is one of those areas where you can get sabotaged very badly and is deliciously fun! Players then place the ships they have won at one of 3 available berths (as long as they have the bollards to support the ships) and perform shifting of goods action. 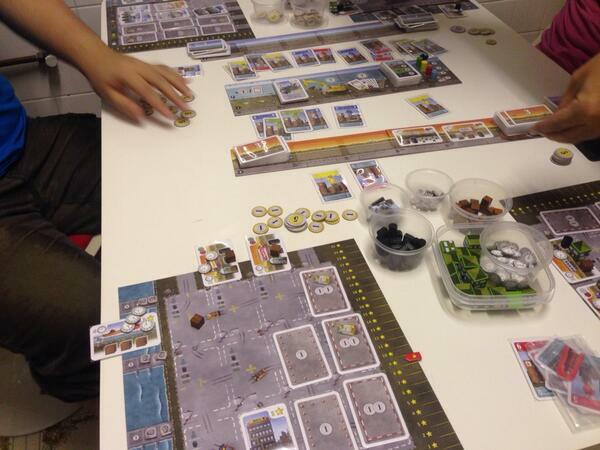 Players have individual player boards with spaces to denote how many goods each space can store. You can also construct more spaces. Spaces can also required when placing buildings. Players then perform the produce phase. This is where the buildings come in. Some buildings give both points and goods. Otherwise have special actions like negating negative points when completing contracts for example. Players then adjust the points track based on how many points they have on their board at that time. If it is lower than what they have previously scored, then the score marker does not move. This is similar to Colosseum. As mentioned, most of the points will come from ships and buildings so it is not easy to push up the score marker. Next player remove time tokens from ships/contracts. This is another key aspect of the game. When you obtain ships and contracts and place them onto your board, you will add a number of time tokens as indicated on the cards. One time token will always be removed from every card every round. There are events that can affect this though but generally its one per round. After this, players check the ships and contracts. Ships that have no more time tokens will sail away, taking with them any goods that are left on them. Contracts with no time tokens will drive away and you get to fulfill them. Check the current market prices and the goods that you have delivered and you will get the money. If you did not fully complete the contract, you may get penalties (usually in terms of money). If you fully fulfill, then you will get bonus and this can be in terms of extra money or points! Finally, perform the event, shift the ship token (which indicates the number of rounds), check if the ship token has reached the end and if not, start a new round. All in all, it has been quite a fun game. The level of sabotaging can be very high and quite in your face so if you do not appreciate such games, do avoid. The turn order plays an important part. While you maybe first player and get 4 coins per round, you can get sabotaged easily if you spread yourself too thin. This part reminds me of Vanuatu where turn order is equally important in determining the actions available to a player. Everything else though are common mechanics. Getting goods, then fulfilling contracts and getting rewards. Nothing new there. Its not a perfect game though and there are quite a few issues it seems. Firstly, if you follow the forums, it seems that there are many issues with what you get in the game. Missing components seems to be the main culprit and it is disheartening that you don't seem to get what you purchased. My friend commented it seemed as if the publisher let this game fall by the wayside and concentrated on their other Essen releases. if I am the designer, I will be very disappointed because this is my first game and the delivery was poor. The scoring seems to create often ridiculous amounts of points. In our game, the winner had 700+ points and some have commented they can get 1000+ points in the forums. The designer has suggested a variant where you will score points equals to the lower of the two: Points / Money. This might be a better way to play the game I feel as players will need to balance between the two thus making them focus on all areas of the game instead of just gunning for 1. The events seems very swingly and maybe too random. There were events which allowed you to steal items from your opponents or pay for remaining contracts / ships in your play area. I feel that this can be done away and will not detract from the game. In summary, while it was fun to play, I am not too sure about the legs on this and whether it will last. It is a good first effort but the lackluster quality is disappointing especially for those that bought it at essen. There is a lot of take that which I enjoy but maybe too frustrating for others. In the end, it is a rehash of existing mechanisms and nothing truely new or unique. Try before you buy!